Is BluRay finally taking off? Last week we received more orders for Gone Fishing on BluRay than we had in all the moths since it was released (and I just put them all in mailers today - see pic)! About half were from the USA, and the others from the UK. Could this signify that BluRay has finally got a foothold in the consumer market? I rent BluRay’s from Blockbuster and there always seems to be as many customers looking at BluRay rentals than at traditional DVD ones, and the BluRay is only 25% of the whole store. And with PS3 offering BluRay and players now being sold for under £100, it does look like this Christmas may well be the one where finally, we all have something that can really show off that whopping great HD TV we convinced our partners were essential to life as we know it! (I managed to convince Lucia by buying her the entire Harry Potter collection on BluRay. I know the Twilight saga will follow). I had never really thought about it that way – you can ask friends round and show them the film without it dominating the whole evening in a way that a feature film would. Interesting. Anyway, if you want to buy a BluRay of Gone Fishing, you can do so here (the disk was mastered at Abbey Road Studios where the Beatles recorded that famous album) – and just for the run up to Xmas, if you buy the BluRay version, we will throw in an extra DVD into the mailer bag too (in its own signed case). You can give that extra DVD to your mum for Xmas, I promise she (and her neighbours) will love it! For the techies, the disk is masterd in full 1080P, direct from the HDCamSR we showed at the premiere at BAFTA. Gone Fishing is now on BluRay! Yes, you can buy your own BluRay disk of Gone Fishing now, with stunning HD pictures in 1080P and uncompressed 5.1 audio, made from the HDCamSR master of the film. We are packaging it with the DVD which has all the bonus features (if you previously bought Gone Fishing on DVD and want an ‘upgrade’, drop me a line here and I will et you know the details). The Bluray was mastered at Abbey Road Studios, and you can read how it all worked here on the blog. The BluRay is stunning quality and really does create the home theatrical experience, assuming you have an HD TV or better, projector and super duper sound system. I also registered the domain www.buygonefishing.com, something I wish I had done at the very start of production. Everywhere I have been, people have asked to buy a copy on disk, and if I don’t have a disk in my bag (and after a few months at festivals you do run out! ), I send them to the blog. But I feel I have lost quite a few sales as people just didn’t remember the blog URL. www.buygonefishing.com is so simple, anyone could remember it. I wish I had also put this on the end titles of the film, and even printed a small business card with just the sales information and quotes on it. So the tip here is, when you setup your website, also think about the www.buymymovienamehere.com. If your DVD is not available straight away, you can always start up an email list form that page or better, pre-sell the disk. I think this microsite approach is super important as people are finding we film makers, more and more, through other channels like Facebook, Twitter and Blogs, and not necessarily through our traditional websites. That's it exactly Dominic. They have to be able to logically link their action with the URL - I want to Buy Gine Fishing and so I will either type in the URL or serach Google. Today I went back to Abbey Road studios to meet up with Richard Osborne (pictured here) who was good enough to take on making the BluRay of Gone Fishing for us. Because of the Beetles famous cover album, photographed on the zebra crossing just outside, the studio entrance is always crammed with tourists. It’s quite astonishing how that album cover has created such a landmark for music lovers. So when I got there, I watched the movie on their enormous 65 inch LCD screen, and as expected, the BluRay production was incredible – Richard REALLY knows his stuff. It was made from an HDCam tape (for pic) and Broadcast BWAV audio file (polyphonic, containing all six channels). Picture was immaculate, and it also sounded superb because of the 24 bit uncompressed sound. Richard explained that they had done many high profile BluRay disks, including things like Elton Johns last concert, shot in HD – but the problem with HD formats at events like a concert, is that it’s so clean, it’s so sharp, it has so much depth of field (where everything is in focus) that audiences eyes are often drawn away from the centrepiece and onto other more trivial detail. It’s just so clear and sharp. 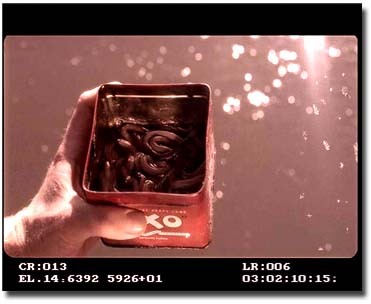 Gone Fishing, being shot on 35mm film, does not have this problem – rather it is clear and sharp, but audiences eyes are drawn to specific places in the shot because we managed the depth of field and focus to draw them to that point of focus. So Richard used Gone Fishing a few weeks back at an event to try and bring new customers to their facility, customers specifically in the feature market and not music business (for which Abbey are world famous). I smiled when he told me that Gone Fishing, looking and sounding so good, actually secured two new accounts with two major film distributors. WAY TO GO! He showed them the big action scene in the middle and when he paused it, they all demanded he allow them to see how it all played out. Pardon the pun, but it seems like they were hooked! I was so pleased with the quality of the BluRay, it has started me thinking about an event – a kind of 35mm vs BluRay (for distribution on a small sale), because I have Gone Fishing post produced to the highest possible quality on both formats now. I am going to make some calls to see if I can set this up. The advantages of BluRay over 35mm for small scale distribution are clear, and I really do wonder, would anyone be able to tell the difference when projected in a cinema? And if they can, which would they prefer? And now hardware also needs software to work! My BluRay player is more computer than simple player in the classic sense of a CD player for instance. This problem has just cropped up with the guys doing the BluRay master. Even though they were assured that their HDCamSR player could play back the max definition tape we have of Gone Fishing, that’s in SR 4:4:4 – it turns out it couldn’t, or perhaps, their player didn’t like my tape? Who knows. The point is, once you are at the cutting edge of technology, problems through no fault of yours or theirs, seem to manifest. The lesson is of course, don’t be the guinea pig! This doesn’t bode well for anyone embarking on a feature film shot on the Red camera for instance. I would love to hear from anyone who has done it so we can nail down a work flow. So now we are dropping down to HDCam 4:2:2 and making the BluRay from that. And don’t even get me started about the 24fps thing – or is that 23.97fps? Or 25fps? I thought HD was supposed to make everything easier and cheaper. It’s a shame we now seem to have a gazillion format permutations to choose from, making it really hard, even for experts, to navigate the murky waters of final mastering. On another exciting note, the film (DPX files) was scanned to negative last weekend at Cinesiste by superstar Mitch Mitchell, and is now at the labs being processed. The audio is also being shot now, by Warwick sound I believe, and within a few days we should see out first Com / Opt 35mm print. And that means a print will definitely be under my arm on that flight to Cannes! I just had a strange experience. 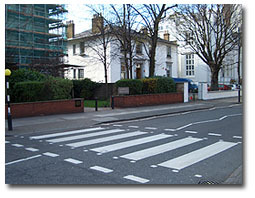 I set up a meeting with BluRay guru Richard Osborne at Abbey Road Studios and tubed over – I hadn’t realised just what a Mecca that zebra crossing outside the building is to Beatles fans and tourists. I had to fight my way past giggling groups of Japanese women all of whom kept walking across the road excitedly and holding up traffic. And the walls were covered in fan graffiti. Amazing. And then I found I was walking in through the front doors, under the jealous gaze of a few fans outside. 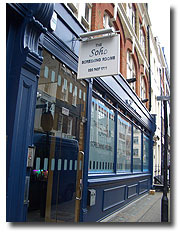 There is a history of Abbey Road Studios on Wiki here. You may know that I have mastered my own BluRay disk, but there were a few problems with it. I used Adobe Audition and I could only master it in 1080i / 25i (not progressive scan). This meant speeding the picture and sound up by 4% and also delivering the image in an interlaced format. Actually the picture looked great as I mastered it from a TIFF stream directly off the hard drives at Midnight Transfer (who did the grade). But it was the sound that was disappointing. After going to all the trouble of doing such a great job at Videosonics, the best I could achieve with Audition was a Dolby Digital 5.1 AC3 file at 400kbs - which meant a huge amount of audio compression. BluRay can deliver completely uncompressed 24bit sound. So acoustically it should be awesome. And off my disk, it was good, but not THAT good. Richard, a contact Eddie Hamilton had made, offered to re-master the BluRay disk after he found out I was having so many problems. These guys don’t mess around – they work directly from the HDCamSR tape, with full 4:4:4 sampling and uncompressed 24 bit sound. Effectively, there is no way to make a higher quality disk. Richard will also master the movie without copy protection so that I can copy it myself and make more BR disks from that single master disk. Best of all, they have an AMAZING screening room with speakers about as big as, er, me! Richard reckons it’s going to be a couple of weeks turnaround. I CAN’T WAIT. I went to My Youngs screening rooms yesterday (aka The Soho Screening Rooms on D’Arbly Street, W1), to test the BluRay disk I made in Adobe Encore. One of the problems we have right now is that to screen Gone Fishing in all its HD splendour and full uncompressed audio means hiring in expensive HDCamSR decks – that’s £400 a day, plus the cost of the technician an theatre – and to do multiple screenings, it’s quickly going to become more expensive than the film actually cost! The 35mm transfer is coming along, but it’s still not there. Hopefully next week we will be slipping in at Cinesite, between Batman and Harry Potter. BluRay seemed to be the perfect alternative HD format. It’s cheap to create and reproduce, and players are becoming more common (in fact I could actually take a player with me wherever I go). So the idea was to test how it looked, out in the wild so to say, at Mr Youngs. The first acid test was to see if it would play at all. Rather entertainingly, in the high tech projection room I saw that they were actually playing back BluRay from a PS3! Bur it played just fine, in full 1080P – and it looked and sounded terrific too. The guy who runs the place, Colin, explained that the whole building works on component video, so it’s an analogue signal that goes to the projector. He explained that they did try HDMI on occasion, but they have had problems with the digital copy protection, so they abandoned and went for component only. Apparently, BluRay is very common with American film makers as it’s cheap and easy to bring over on a plane, and the whole PAL or NTSC thing just does not come into play. Makes perfect sense. So good news then, we can present Gone Fishing in full HD and in a professional theatre that film business people are familiar with. And it’s good news for Indie film makers too as it’s a way to present your work without it costing an arm and a leg. Final Mix Tweaked and Complete! Last night I went back to work on the final mix for Gone Fishing at Videosonics. There were two aspects to what we were doing. First off, there were three small creative changes to the sound mix, things I picked up while viewing the film outside of the studio environment. We changed two and left one the same as before as that really was the best we could get it. These were very small changes and again, as I said months ago on the blog, it’s wonderful to be able to go back and nudge ‘99.9% happy’ into ‘100% over the moon’. The second aspect to what we were doing was entirely practical. Backing up gigabytes of data, doing a speeded up version to 25fps, and finally a bit depth conversion, from 24bit sound to 16bit sound. All these versions are really for different media releases, such as PAL TV (which is 25fps), DVD (25fps and 16bit), and BluRay (25fps and 24bit), as well as the original which was 24bit, 24fps which is now encoded for Dolby processing onto an MO disk, and then to 35mm print. Phew! I have been having problems making an audio stream for the BluRay disk, which in theory can handle 24bit uncompressed sound, which is much better than DVD or what you would hear in a cinema. 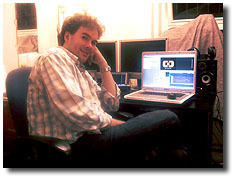 A good friend of Eddie Hamilton’s and DVD / BluRay guru Richard Osborne has stepped in to help with the audio encoding. I will report in due course on how things go, but the good news is, this probably means we will have a consumer disk of ‘Gone Fishing’ in 1080 HD and the full audio quality at 24bit. Hooooorah! PROOF OF CONCEPT! IT WORKS! And in fact, proof of workflow too! Yes tonight, I burnt my very first BluRay test disk of a clip from ‘Gone Fishing’ – AND IT WORKED...! PROPELLOR HEAD ALERT! READ ONLY IF YOU ARE A GEEK LIKE ME! I can report that the high definition does in fact make a HUGE difference when viewed properly. Perhaps this is not so visible on a TV but on my digital projector, it’s awesome with no pixilation, no digital artefacts, and razor sharp images - I can even see, very clearly, film grain (pic here is from my BIG screen!). To get to this point has been a major uphill struggle as it appears no-one seems to know what they are talking about when it comes to mastering HD onto a domestic format. Even Sony, who have tried to get to the bottom of my questions, have scratched their heads at times. It seems like there are all manner of ways to do it if you are uploading from a camcorder, with just stereo sound…. But as soon as you say surround sound and working with uncompressed HD, people look at you in horror. I have been using Adobe Encore CS (vers 3) to master disks, with its own unique twist (I had to master in 25i, which is in fact 25P delivered in two separate interlaced chunks - and as the image is progressive to start off with, it makes no difference at the end). So here is how I did it… or rather how I will do it now I know it will work. 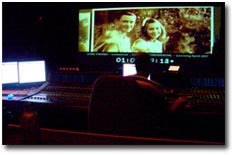 The movie was mastered at Midnight Transfer and exported as a 10bit TIFF stream, each of the 20,000 fames being just over 11mb (saved at 1080 x 1920 progressive images). I would use an NTFS formatted drive if I did it again (see earlier posts for general hair pulling). I then used Avid Media Composer (software only version) to import it into a 25P 1080P project (not a 24P project as Encore currently does not support 24P properly – it does support 24P in NTSC, but it actually converts it to 24P into 29.97 FPS when it encodes, which frankly, is pants). I imported it into Avid at the DNX185 resolution for the tests, but when I redo it over the next few days, I will do it at 1:1 10bit uncompressed. This will maintain maximum fidelity in the images. Taking the TIFF stream into the Avid took 5 hours. This is the firsat glimpse of how much data and power is needed to handle true HD, not 25mbit HDV passing itself off as true HD. It didn’t speed up or slow down whether it was being saved as DNX185 or 1:1 so that implies that speed bottleneck is the USB2 drive and not the Avid. As for playing back, forget it, it just could not handle the bandwidth. Once on a timeline, I exported a Quicktime reference file, which was created in seconds. I could then take it into a BluRay project in Abobe Encore, which was set to PAL / 25i / 1080 Blu-Ray. I already had the sound from the DVD I made, so that was already in place (see earlier posts). I dropped the QT reference file on the time line and then selected the rendering settings. I chose the best quality, with 2 pass encoding and using H264 compression and not MPEG2 as I have read it gives better results. I hit RENDER… and I waited. On my Dual Core 2.4ghz / 3GB RAM new PC (and I think it was using both cores) it took about one hour render about one minute. Remember, BluRay is physically six times bigger than PAL DVD files. The big question I had was how would the disk burn and would it even play? 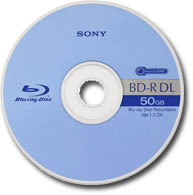 Blank BluRay disks are about a tenner a pop, with re-writable disks costing a few pounds more. So of course, I tried a RW disk first. And it worked without a problem, both in my BR burner (which costs about £160) and my Samsung BluRay player, which can be bought on the web now for about £250. So that’s that short tale without the many, many headaches I encountered on the way. I am just waiting now for a few new frames from Midnight Transfer and I should be able to build my final BluRay disk! I just spoke to Eddie the editor and he commented on how amazing it is – you can now shoot and master to HD, even present in full HD in the home, with amazing surround sound too. Blimey! Blimey! And thrice blimey! Last night, editor Ediie Hamilton came round to my flat to watch the directors cut of Kingdom of Heaven that I had rented on BluRay from Amazon (it's an improvement over the original cut for sure as it makes sense and does not feel rushed). It stopped playing three times as we watched, due to minor scratches on the disk surface. This is something that DVD doesn’t do unless it’s a bad circular scratch. For me, it’s another reason why consumers won’t buy into HD on a disk. It just isn’t bullet proof in the way DVD is now. Eddie also brought a short film with him that we watched. It was very well produced and an excellent piece of narrative film making, with a great story twist halfway through. But, while watching it, I realised something. I have seen many short films over the years and there are some common themes that crop up regularly. Many shorts tend to be quite ‘grown up’, with adult themes, relationships, and very often, they are set in ‘the city’ where the film makers live. All of this makes sense from a production perspective of course. But it can tend to make many shorts blur into a single – especially at a festival where you might see 50 or even 100 short films. It occurred to me when I reflected on ‘Gone Fishing’ that I had, perhaps instinctively, certainly not consciously, avoided that scenario. ‘Gone Fishing’ is not in any way about people in the 20’s or 30’s with grown up issues or relationships, and it’s also set in the wilds with not a hint of urban backdrop. It’s also not serious or dark in the way many other shorts are, though it is sincere and touching. It’s an interesting distinction for me, as one of the things I set out to do with ‘Gone Fishing’, was to be in every way I could, different to what everyone else was doing, to stand out. And I think this story and scenario distinction, while not consciously engineered, is in fact present and is definitely helping. So I have now committed to BluRay (did they not realise that if you are not clear when you say BluRay it sounds like you say Blurry, not to mention Blurry is what my spell checker wants to change it to!) after several studios jumped camp and ditched HD DVD. The word from up top went along the lines of… ‘Consumers don’t know which format to chose, BluRay or HD DVD, fearing they will buy the one that loses the format war – so they wait, and both formats suffer… PS3 has sold a gazillion units, so let’s get behind BluRay…’ And so the format war appears to be drawing to a close. We will see. So today, I went to Midnight Transfer who have rendered the whole movie out as a series of 10bit TIFF images. Nearly 20,000 11mb files in all. That’s a lot of data. The plan is to take this TIFF sequence into Avid, and render out an HD stream which I can then burn to BluRay so that I have Gone Fishing on a domestic HD format for showing when I don’t have an HDCamSR deck or 35mm projector to hand. Each file and subdirectory takes from two to thirteen entries, depending on the length of its name (the 8.3 format taking only 2), so with longer names, the available entries can reduce very fast, to the point where you just can’t fit 20,000 files in a single directory – which is why all day the system kept failing. Grrrr! In short, we hit about 15,000 files before we maxed out and the copying crashed out. Now the problem is I need to shift all of the data onto another drive, so I can reformat the other drive into NTFS which can handle 4,294,967,295 entries. Now that’s better! So why bother with old FAT32 format at all? I am sure there are other reasons but one is that it seems that Macs don’t like NTFS and can only read NTFS formatted drives and not write to them. Ho hum. So finally I have got to the bottom of an entire days head-scratching. Now my PC will be on all night as it shifts 220gb of data, in 20,000 files, onto another drive. In the morning I will reformat the old drive into NTFS and shift the same 220gb of data back, then drop it all into a single folder, and then… hopefully, import it into Avid. I thought I would be mastering a BluRay disk today. Now it looks like I won’t even get there until late tomorrow night. And this is just a short film! The mind boggles at the notion of a feature film. The moral? Remember you are pushing desktop technology past it's tolerance when working in true HD. There is just a huge amount of data and files to deal with. And pre-format your drives into NTFS if working on a PC. 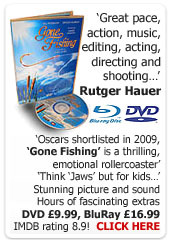 I am now working out how to make an HD DVD or BluRay disk for Gone Fishing, so I can show it on courses and at home in HD – and also, send it off to festivals (if they start to move in the ‘domestic HD delivery format’ direction). While the difference between DVD and HD-DVD / BluRay is not sooooo noticeable to the layperson, on a big screen (projected), you can really see it, especially when you see one next to the other. So far, the tools to make an HD disk are pretty thin on the ground. There are lot’s of ‘halfway houses’ on both Mac and PC, designed really for HDV home movies or Sony BluRay camcorders, but my problem is accommodating 24fps AND 5.1 24bit sound. So I have to approach sound and picture separately. As it stands, I think I may be forced into a 25fps version of Gone Fishing – but that may not be set in stone just yet. As for sound, I previously made a Dolby Digital AC3 file which worked well on DVD, but it’s highly compressed like MP3 and I could hear we were losing detail. I have since found a way of encoding in DTS, which has a bit rate of 1.5mb/s, opposed to the max of Dolby Digital which is 640kb/s (and usually lower). So effectively, DTS has three times more digital data – and you can hear it! I made a test DVD last night and was really impressed with the sound I got with this extra information. So for now, DTS will be the way that I deliver the sound on the HD disk I choose. It isn’t 24bit, but until I find a better way, DTS is good enough. In fact it’s splendid! And of course, even the cheapest players now handle DTS sound. Now, onto the picture element… How on earth do I get it onto my PC in full uncompressed HD, and then encoded into a stream that the HD-DVD / BluRay software can handle? Crickey. Watch this space. One of the reasons I went for HD DVD over BluRay was that I knew that it was much closer to DVD than BluRay is, on a purely technical and mastering level. After doing some poking around, I discovered something rather cool – it’s possible to master an HD DVD onto a normal DVD. This means, using my old DVD technology (basically a £20 burner on my PC) with cheap and cheerful DVD-R disks (at less than 10p a pop), I can now make HD DVD’s at home. But… there are limits. Having a much smaller disk size means that I can store less on a DVD than on an HD DVD (which comes in 15gb and 30gb varieties). I haven’t tried DVD 9 disks yet, but it appears that DVD 5 disks will happily carry a short film. Reports on the web suggest anywhere between 20 mins and 50 mins. Of course that is dependent on data bandwidth and most of us are going to want high quality, so that means shorter video times. Of course, this should all be easy! I wish! It astonishes me at how muddy the water becomes when you start saying that dreaded phrase - HD – is that 720p 03 1080i? And what is the other axis, full HD or compressed pixels? PAL or NTSC? Hang on, wasn’t HD supposed to be a universal format? Grrrrr! It seems to me that there are a squillion different HD formats, and all claim to be compatible! For now, I have been running tests by using a really excellent slideshow program called ProShow Gold, to render a short HD MPEG, (1920 x 1080) at 25P, and at also at 60i, then importing into ULead Video Studio, making a simple HD DVD, rendering out and burning a disk. The first few attempts have been haphazard – the very first was a 60i MPEG that played back but was jerky (I think it re-encoded to 25P), followed by a series of dead disks, and as I write, I am attempting a 25P 1080P conversion to 1080i 50i. Blimey, you’d think that all of this would have been streamlined by now. It really should not be this difficult. Once I get a workflow that is solid, I will have to deal with the further problem of how on earth do I get HDCamSR onto my computer? I have a suspicion I will end up getting a facility to encode the file which I will then master and burn from home. Stop Press - I finally got it to wrk in 1080 x 1920 60i, and at first glance it was underwhelming. Then I realised that it was a limitation of the source material (not the HD delivery), and when I got to the end of the slideshow, I had a few very high definition professional photos, and the quality was simply smashing. Really eye popping. Crisp, sharp, detailed, no compression artefacts, smooth (I worried that DVD would not be able to sustain the data bandwidth but it held up fine...) I will keep you abreast of further developments. But for now, it seems as long as I make the project 1920 x 1080 24p, then all should be awesome. 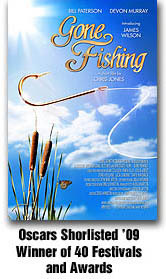 'Gone Fishing' at home on HD DVD burnt onto a 15p disk! Crikey. A few days ago I took delivery of a Toshiba HD-EP30 HD DVD player so that I can get my head around HD in the home. I have a projector that I use on my courses, and it’s quite new, claiming to handle up to 1080P full HD. The projector, a Panasonic one, was quite cheap at about £600ish, and is an LCD one, so suffers a little from slightly milky blacks. But when I saw it in a demo, I was very impressed by the definition and brightness and the price. So HD DVD was going to be an acid test for this projector and the whole idea of affordable high quality Home Cinema. After a long hard look and listen, I can say that the quality on a home projector is quite stunning. With no pixilation visible, no artefacts, in fact the only downer is that you can clearly see the 35mm film grain! Sound is also better. I have a great sound setup and DVD 5.1 sound is very good on it. I wasn’t sure it could be improved, but it is on HD DVD. I can’t quite explain what is better, it’s just more defined, especially dialogue tracks through the centre speaker. Overall then, excellent, but you do need the setup to really ‘see the difference’. I later watched a DVD on my 32” TV, and DVD is absolutely perfect at the size, at a reasonable comfy sofa distance. I am just waiting now for my HD DVD of ‘Blade Runner’ to arrive and for a few hours one evening next week, my life will be complete. I also joined the online Amazon DVD rental club as for £3.99 I get two HD DVD disks rented every month. I have learned my lesson with DVD and will only buy a select few must have HD DVD titles. 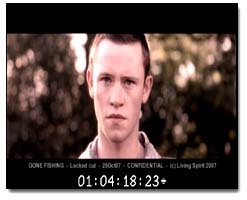 I can’t wait to get ‘Gone Fishing’ completed now, and mastered onto both HD DVD and BluRay, as I now know I can present the film at home in a near theatric quality – both sound and picture. Amazing! I've decided to get a PS3 myself as it seems like a good deal and I'm a bit of a gamer. I have made a choice though. HD DVD. This is for a variety of reasons. 1. It’s just cheaper to buy the player (£180 from Amazon) and it’s also cheaper to manufacture the disks. 2. I plan to sell the player once I have done all my work on Gone Fishing, and re-buy a dual format player later down the line, so I can play both HD DVD and BluRay. 3. HD DVD does not have region coding (though the DVD playback does). I fundamentally disagree with region coding and always have. It’s just plain dumb and I believe encourages casual piracy (though not organised piracy). 4. But most of all, I need to dip my toes into the consumer HD market, knowing it will all change rapidly anyway, so I want to minimise any investment. I am back onto Gone Fishing today, and off to the film clinic to inspect the camera negative before digitising for the final mastering. 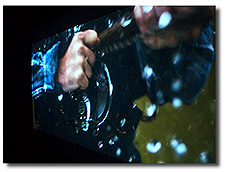 Gone Fishing Mastering - BluRay or HD DVD? One of the things I decided I would do with ‘Gone Fishing’ is to go through the whole consumer HD process – that is, as well as making the full 35mm / HDCam SR master, I would also make a domestic HD disk (this will be useful for some film festivals I am hoping). That means BluRay or HD DVD. And I can’t tell you how annoyed I am at the current ridiculous format war! So right now, it’s chose - BluRay or HD-DVD? And of course, one will not play the other. Technically, there isn’t much to separate the two formats. BluRay disks hold more than HD DVD, but it’s not that important to my mind as most films are not Ben Hurr! I have seen both side by side, and I can tell you, to my eye, there is little to nothing in it. HD DVD was first out of the gate and has a greater disk to player ratio than BluRay – that means fewer players sold than BluRay, but those people who bought HD DVD buy more disks. Sony fumbled the release of BluRay buy using significantly poorer encoding methods for the disks, which makes some films very poor in comparison to HD DVD (though new releases should not be affected). Both will handle multiple resolutions up to 1080p. Not that you can really get a TV that cheaply that can handle that resolution (most claim to do so, but actually they down-convert to 720p!). HD DVD does not appear to have region coding where BluRay does. Of course, BluRay comes as standard on PS3, and HD DVD can be used with X-Box (with an extra drive). I can’t help but feel BluRay player sales are artificially increased by PS3 sales. New players will start to emerge in the next year that will handle both formats. At last! So the question. If I am to master ‘Gone Fishing’ in an HD domestic format so I can go through the process and learn how to do this, which format do I chose? One key thing is that I must be able to play it back at home, or what is the point? I have to take the whole process through to the logical consumer end to have that experience… ‘It looked great when mastering but when I saw it home I noticed… yada yada yada…’ Which now leaves me with a very annoying choice – do I buy a BluRay or HD DVD player? I could buy a PS3 and use that, selling it in a year or so on eBay when dual format players are around? Blockbuster also carry BluRay (my local does not carry HD DVD for rental). But HD DVD is cheaper, the disk manufacture is cheaper also, and frankly, Blade Runner is being released next week on HD DVD. Hmmmm. I have really struggled with this one as I hate wasting money and I can’t help but feel that making an investment now into either BluRay or HD DVD is a bad way to spend cash! Grrrrrr! I will make my choice in the next few days and let you know how I get on. Gone Fishing Locks Picture Edit at 1.45am! So we locked the picture edit at 1.45am last night. Editor Eddie Hamilton and I made a huge number of tweaks that at first glance, are fairly minimal in impact, but we both know that they made a big difference holistically. At one point Eddie stopped and looked at me grinning and commenting that ‘it’s so good, and so rare, to get the chance to come back to an edit after a short break, to make these small but important changes…’ I knew exactly what he meant. It’s not that the previous edits were wrong or bad, it’s just that some of them could be better. Editing is often like musical composition, you are looking for rhythm, using timbre of voice, contrast of image and sound, timing of performance, all to its maximum effect within the confines of the story and the style of story telling. Editing begins as a technical construction, moves into the world of craft and ends up in the realm or artists, using feeling and emotion to guide your choices. During this final edit, we played with a few new ideas too, some of which worked, some of which didn’t. We also ditched a lot of the shots of Goliath, the killer pike, replacing him with swelling water. This was simply because water is hard to scale in the mind of the viewer (something we discovered and found surprising in test screenings), and Goliath simply looked smaller than he actually was. I learned something there - about water, scaling it, using slow motion and scaled props in shot etc… As Eddie put it though, we had to shoot it to know that it wouldn’t work fully (though there are still shots used). Film makers ‘due diligence’ as it were. Last night also included making all the deliverables for the sound guys – exporting all the audio, making a QT files with time code, and adding an academy leader. It was when Eddie added the Academy leader (the countdown clock at the start of a film) that I got goose bumps, mainly because I heard the ‘plop on two...’ This is a one frame beep that sound guys use to sync the film up (of course time codes and such usually take care of all of this but it’s nice to have this old school rock solid backup). And it’s the plop that for me is synonymous with sitting in the final mix, in a dubbing theatre, and watching the magic of sound mixing bring your film fully to life. I was giddy as a schoolboy! There is still a long way to go, completing VFX, track laying sound, mixing the sound, clearing music, grading picture, checking and making titles, making a DVD, making a Blu Ray (that’s a new one for me!). Not to mention, festivals… and the attempt at the Oscars! I thought I would just outline our post production process so far, for those who are interested. We shot 35mm, which was processed overnight at Bucks labs, and then shipped in the morning to central London where Midnight Transfer did the 35mm telecine to DVCam, with all the relevant information such as lab roll, timecodes and keycodes. Remember, this is an offline cut, not the master conform and grade. For that we will go back to the 35mm and re-transfer at full 2k res. 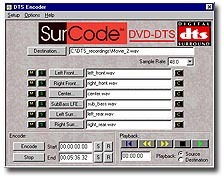 This DVCam tape was then digitised onto an Avid Media Composer (on a laptop, software only) and the rushes were sunk with the production sound which came in from sound recordist Ro Heap on DVD, recorded in 24bit (24bit, opposed to 16bit, for extra on set headroom) and 48khz sample rate. 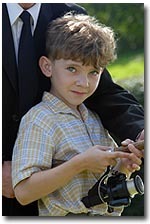 Accordingly, the Avid project was setup in 24bit. Once the rushes were sunk, we could do the edit, which Eddie Hamilton did. Tonight I am planning to do the final edit, integrating the new material we shot last Friday. Once that is done we will have one last test screening to make sure there are no gaffs. I am also going to do some ADR with Bill Patterson to help the story along and clean up some location dialogue. Once all that is in place, we will begin the final mastering stages of sound and picture. So for now, Eddie has all the data on his laptop, and I have a cloned Firewire drive of all the media and the project, so I can view edits should Eddie make any changes while I am not present (he can just email me the project as I have the media already). Broadly, we hope that Videosonics will do the audio mix and Midnight Transfer are going to do the picture grade. I will outline just how all that works when we get closer to the time. One last thought, I do plan to make a BueRay or HD-DVD version of the film, simply to go through the process and learn the pitfalls and advantages of these new formats. I am looking forward very much to this as it will be a good real world test of the process and technology, and of the results possible. If it’s as good as both the HD-DVD and BluRay camps claim, I suspect festivals in the future will start to accept BluRay and HD-DVD disks for submission. Things are kicking off this end. One thing that has always eaten into my creative time is making DVD’s. So I am biting the bullet and making my own DVD duplicator. This is for all sorts of stuff, but I am looking now to the future with ‘Gone Fishing’ and ‘RocketBoy’. In my experience, people want to see stuff on disks and they want it fast and professionally presented. Mastering the shows or sequences isn’t a problem, but making lots of disks, while easy, takes longer than you would think. So I have taken step one of a multi step plan – building the DVD duplicator. You can buy pre built units, but I have a few spare DVD-R drives and a 320gb hard drive, so I bough the bits and will assemble them this week. This will be a four drive burner, with internal Hard Drive partitioned into 25 separate 10gb partitions. Each partition can hold a dual layer DVD, which means I can store 25 'virtual' DVD’s on the stand alone unit (no need to connect to the computer - amazing! ), and burn four DVD’s at a time (at up to 16 speed, though from experience, I will probably stick to 4 or 8 speed). At full whack I should be able to burn around 30 – 50 disks an hour. All this for under £200!